One of the reasons many love solar panels for their home or business is that they provide reliable energy but don’t require a lot of maintenance. Your solar array does need a little attention now and then, though, if you want your system to last for many years to come! Regularly checking your panels and keeping them free of dirt and debris will ensure you are getting the most from your solar investment. Here are the few things you should regularly be doing, in between annual, comprehensive check-ups from your solar contractor! 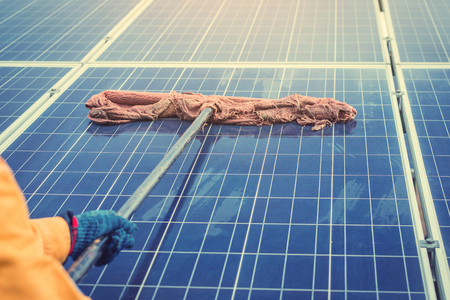 If you want to maximize the efficiency of your solar panels, you need to keep them free of dust, dirt, leaves, and snow. Anything that covers the photovoltaic cells will limit the amount of sun they can absorb. Check your panels monthly for any obstructions and use a soft brush or clean rag to carefully remove dirt. If there is snow covering the panel, remove it carefully with a broom or snow brush. If your panels are too high to reach them safely yourself, you should sign up for a monthly service contract with a professional solar contractor to perform this regular task. When you are cleaning your panels, you should take a look around at all your wiring, components, and mounting rack. Inspect the points where your rack penetrates your roof for any signs of water damage, leaks, or drainage issues. During your inspection, look for missing bolts, broken glass, and frayed wiring. Catching problems early on can prevent them from becoming serious issues that turn into costly repairs. If you notice any of these or other problems, you should contact your solar contractor at once. Don’t try to repair these yourself; your solar system is best repaired by a trained professional. If you want your solar system to last as long as possible, you should have it inspected once a year by a professional solar contractor. This comprehensive annual checkup will evaluate all components, ensure everything is working as efficiently as possible, and allow you to address issues that are affecting the health of your solar system. Learn more about solar panels and renewable energy on our blog and when you’re in need of the reliable photovoltaic solar panels, call on the professionals at Empire Clean Energy Supply. Call us today at 631-589-4340 to learn more!